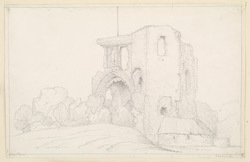 Drawing of the ruined great gatehouse of Denbigh Castle in Wales. This was one of the highlights of the castle, possibly designed by celebrated castle mason Master James of St George. It was of an unusual design a large octagonal tower buttressed by two octagonal towers on either side. Above the archway is a carved figure which may be Edward I and decorative stone work. However Denbigh Castle was not a royal castle. It was built by Henry de Lacy, Earl of Lincoln and one of Edward I's wealthiest and militarily successful barons. It was built in two stages during the period 1282-1311. This gatehouse was one of the later buildings.